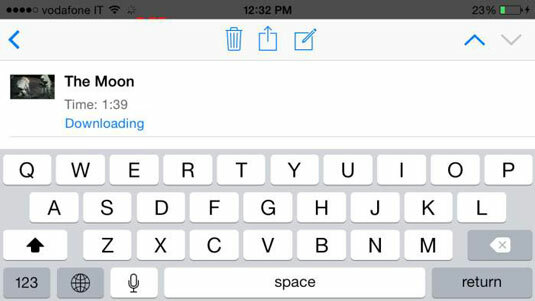 Tap the Library button in the upper right. You see the courses and collections you subscribed to. The number tells you how many new episodes have been added since you first subscribed. Tap a course or collection to open it and begin learning. Tap the episode to begin listening or watching, or tap a book if you want to begin reading course material. Many of the interactive textbooks can be read-only on an iPad. Tap the Back button to return to the episode list for this course, and then tap Materials to see the materials list. 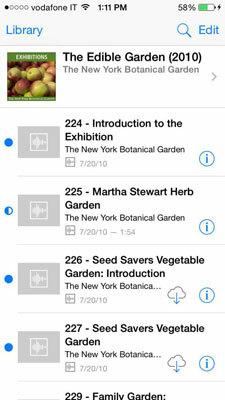 Tap Library to return to your iTunes U library shelf; tap Catalog in the upper-right corner to browse more courses. (Optional) To rearrange the icons on the iTunes U shelf, touch and hold an icon until it gets a bit bigger, and then drag it to a new position. Collections display a simple list of the video or audio comprised. Tap the disclosure arrow next to the collection title to see more information, tap the Info (i) button to see more information about a specific episode, or tap the Download button to download an episode. Tap the Search button to search within the collection or a specific episode. Tap the Edit button to delete episodes you no longer want or remove the collection entirely. 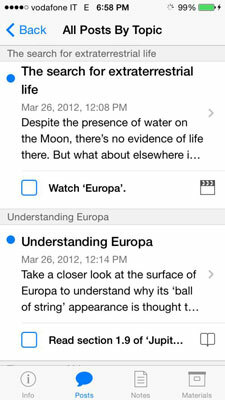 Tap the Search button (the magnifying glass) to search throughout the course or within a specific episode. Tap the Share button to share a link to the course via Mail, Messages, Facebook, or Twitter; copy and paste the link in another app; or print what you see on the screen. Tap the Settings button (gear icon) to change the settings for that individual course: tap the Subscription switch on to receive updated information automatically; tap the Auto Download switch on to download new episodes and materials automatically. At any time, tap the button in the upper-left corner to return to the previous screen. Info: Displays a list that includes buttons to open an Overview, which describes the course, the types of materials, what you can expect to learn, how long the course usually takes, and what education level it’s appropriate for. The Instructor item describes the professor; you may find a link to send an email as well. Outline reveals the syllabus for the course. Tap the Info button in the upper left to return to the Info screen. Posts: These are the lessons and any supplementary material the instructor has provided. Notes: Notes you take are neatly organized here. You can view all your notes together or your course notes, audio/video notes, or book notes. Tap the Plus sign at the top if you want to add a note from this screen. You can also add notes while you are listening or watching an episode. Tap the Notes button in the upper-right corner and then tap the Add button (plus sign). The keyboard opens so you can type a note related to the lecture, which continues to play while you take your note unless you tap Pause. The note shows the time during the lecture that the note was taken so you can easily return to the point related to your note. Tap Notes to see all your notes and then tap Done to return to the lecture. The red lines on the scrubber bar show where you took notes. Materials: Lists all the course materials (which sometimes must be purchased) and gives you the option to view by type: Audio, Video, and Books. Some books are readable only on an iPad. Tap one of the choices to see the list of materials. See more information, download, and listen to or watch the episodes the same way as you would for an episode of a collection. Tap Edit in the upper-right corner to remove downloaded episodes. The playback controls are similar to those you find for audio or video in other apps. You can go back 30 seconds, rewind, fast-forward, jump back or forward an episode, and control the playback speed. In addition to the individual settings that you find when you tap the disclosure triangle next to the name of a course or collection in your Library, you can sync your notes with other iOS devices by opening the Settings app, tapping iTunes U, and tapping the Sync Notes switch on.